Posted August 2, 2012 by Kellen Coffis & filed under Uncategorized. We are getting very close to taking off for Alaska and Salmonstock, and it’s safe to say we’re pretty pumped. We’ve told you a little bit about this festival and who we will be sharing the stage with but it’s worth repeating, so here it is; Ozomatli, Robert Randolph Family Band, Todd Snider, Great American Taxi, Greensky Bluegrass, Leftover Salmon and Clinton Fearon will all be in attendance. We can’t freaking wait. We’re looking forward to performing four (4!) 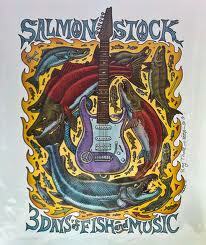 times at Salmonstock. Here’s a closer look at our schedule for this weekend. Did I mention we’re excited?! We’re having a send off show at the Crow’s Nest in Santa Cruz at their weekly beach party event this Thursday August 2nd. We’ll be upstairs and starting at 8:30 PM. We will definitely need some warm Santa Cruz lovin’ before we embark northward, so come on out. Quickly, we’ve added a couple local shows that should be a lot of fun. We’ll be at Don Quixote’s opening for our friends The McCoy Tyler Band at their CD release party on August 16th. We will also be returning to Scotts Valley’s music in the park series at Skypark on Sunday afternoon August 26th. Looking forward to both of these.